You may not have heard of Sensoria, but I think you will. Sensoria has developed a unique process for embedding sensors into fabric. In essence, Sensoria’s fabric is like a textile circuit board, connecting sensors to a Bluetooth transmitter. The first application of this technology has been in socks for runners. The sensors can measure things like cadence and whether the runner is landing too hard, or in the wrong spot. Now, Sensoria is teaming up with Orthotics Holdings to create the Smart Moore Balance Brace, an orthosis designed to prevent falls. The Internet of Things-enabled Smart Moore Balance Brace is an update of the Moore Balance Brace (MBB), launched in 2010. The MBB was created to improve the balance and stability of its users. Features of the new brace allow clinicians to monitor gait parameters and adherence and activity levels of their patients. Sensoria, along with its new sensor technology, has also provided a Bluetooth-enabled anklet that attaches to the MBB and sends collected data to a mobile app and web dashboard for clinicians and users to track results. The Smart MBB is still undergoing market studies, but should become available in 2016. Technology that can reduce the number of falls among older adults is a big deal. According to the Centers for Disease Control (CDC), one of the most serious medical threats facing those 65 and older is falling. The CDC says that one out of three older people falls each year, but fewer than half of them tell their doctor. Falling once doubles your chances of falling again. 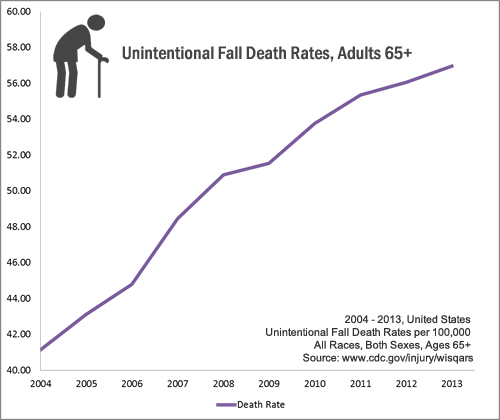 In the past decade, the rate of deaths from unintentional falls has jumped from about 41 per 100,000 to 57 per 100,000. One out of five falls causes a serious injury such as broken bones or a head injury. Each year, 2.5 million older people are treated in emergency departments for fall injuries. Over 700,000 patients a year are hospitalized because of a fall injury, most often because of a head injury or hip fracture. Each year, at least 250,000 older people are hospitalized for hip fractures. More than 95 percent of hip fractures are caused by falling, usually by falling sideways. Falls are the most common cause of traumatic brain injuries. Adjusted for inflation, the direct medical costs for fall injuries are $34 billion annually. Hospital costs account for two-thirds of the total. Fall injuries are among the 20 most expensive medical conditions. The average hospital cost for a fall injury is $35,000. The costs of treating fall injuries goes up with age. Home hazards or dangers such as broken or uneven steps; throw rugs or clutter that can be tripped over and no handrails along stairs or in the bathroom. Most falls are caused by a combination of risk factors. The more risk factors a person has, the greater their chances of falling. There are ways of mitigating the risk of falling, including simple solutions like nightlights or grab bars near the bed or in the bathroom. Even something as simple as sitting up for a couple of minutes before standing can reduce the risk. Changes in gait turn out to be an extremely accurate indicator of the likelihood of a fall, and that’s what the combination of Sensoria’s fabric and the Orthotics Holdings Moore Balance Brace are designed to predict. This is not the first time that technology has been used to try to predict falls. Several years ago, a team of researchers at Technology Research in Independent Living in Dublin (TRIL) which was sponsored by Intel, developed a clinical assessment tool for falls prediction. That technology was licensed to a group of the TRIL researchers who have now teamed up with Care Innovations, the GE-Intel joint venture to try to bring the technology to market. But while the Care Innovation solution requires a clinical setting, the Smart Moore Balance Brace can gather data anywhere and transmit it using a smartphone back to a caregiver or clinician. Gary M. Kaye is the Founder and Chief Content Officer of Tech50+, a website focusing on the nexus of technology and the 50+ market. He is an award winning journalist who has been covering hi tech for 35 years at news outlets such as NBC News, ABC News, CNN, Fox Business Network and others.